There are plenty of ways to get streaming video to your TV—apps for your TV, apps for your Blu-ray player, apps for your gaming console, apps for your smartphone and set-top boxes from Roku and Apple. So when Google announced its $35 video streaming product, Chromecast, I was a little skeptical about whether it could compete with the wide range of existing devices—even at such a low price. I gave it an in-depth review it to find out. Chromecast is a stick that plugs into your TV’s HDMI port and uses your home’s WiFi network to stream video from the Internet. The controller is your laptop computer, Android device or iOS device. Each of the supported streaming services (e.g., Netflix) has a button to send the stream to Chromecast—just press the Chromecast button and it starts playing on your TV. For a device that at its core is about simplicity, Chromecast had to be simple to set up and it was. I plugged the Chromecast into the HDMI port, plugged it into an electrical outlet (you can also plug it into a powered USB port if your TV has one) and turned on the TV. I have a newer model TV, so the Chromecast was able to automatically change my TV to the correct input. Otherwise you'd have to do this manually. Next you need to connect the Chromecast to your home network by browsing to google.com/chromecast/setup on your Mac or PC. My MacBook Air didn’t have Chrome loaded, so it prompted me to install it and then install the Chromecast plugin. Once both were loaded, I could see my Chromecast and it displayed an authorization code in the browser. On the TV, I could see the same authorization code. Once you confirm the codes match, your Chromecast is ready to go. There is no dedicated app to control Chromecast, just a button within the app of the service you want to watch on your TV. Right now Chromecast works directly with Netflix, YouTube and Google Play; other services are in the works. Plus, you can load up any video streaming service or photo sharing service through your Chrome browser for big screen viewing. When you want to watch video on your TV, you start playing it on your mobile device or computer and then hit the Chromecast button. The video will stop playing on your mobile device or computer and start playing on your TV. You still control playback, fast forward, pause etc. from your device. On my recent-model Sony HX850 TV, pressing Chromecast would turn on the TV if it was off and automatically change to the correct input. For an older set, I had to power the TV on and change the input manually. Even then, the process took a lot less time than booting up my game console or Blu-ray player and wading through menus. The only thing that compared to Chromecast in terms of speed and ease of use was pressing the dedicated Netflix button on my TV's remote. Once video is playing, you can use your device for other activities or browse for your next video. WIth the YouTube app, you can also add videos to a play list. If you start playing a video and need to leave the house while someone is still watching, you can transfer control of the Chromecast to another device on your home network. In fact, it’s not really transferring—any device on your network running the app can take control at any time. Pre-order for $35 on Google Play and Amazon. At $35, Chromecast is a bargain for anyone looking to add streaming to a TV with an HDMI port and who doesn't want an extra box sitting next to the TV. The HDMI-stick design means no box to add clutter and the simple interface can't be beat for supported apps. It's a great solution for those looking to watch Netflix and YouTube and rent movies. If you have a TV without an HDMI port, or want to get a broader selection of services than it currently available, consider the Chromecast's closest competitor, the Roku LT ($49.99 on roku.com, $40 on Amazon). The 4" x 4" box provides access to hundreds of streaming services and a remote control, in addition to an app you can use to control the device. The Roku LT also has both HDMI and composite out for older TVs. Can it play downloaded movies? Will this work for movies that are downloaded to a pc or tablet? Can you play the movie on the TV? Enter the path and file name of your movie into the chrome URL bar (e.g., C:\my movies\aliens.mp4) and it will open the movie inside Chrome. Then just hit the Chromecast button to play on your TV. 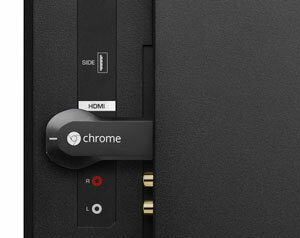 Chromecast sounds even more simple than a Smart TV. With Smart TV’s you need to go through a layer of menu options to get to the streaming service you’d like. Chromecast also looks easier to stream a photo sharing website as well. And I like the multi-tasking element of it so you can surf while watching a movie. I am looking for a device that can be utilized with Amazon Prime Instant Video. Would this work? 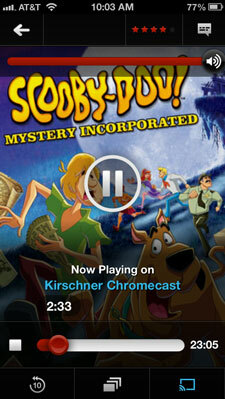 Amazon Prime doesn’t have a built-in Chromecast button in its mobile apps, yet, like Netflix. But if you load up the movie in your computer’s Chrome browser you can easily stream it from there. Why not just Drag & Drop ? If you have already a PC, especially the new desktops with the new video cards with HDMI ports, you can already connect your TV as a “secondary monitor”, so just drag and drop your browser window and enjoy the same thing for free. That's hardly the same thing. Chromecast works through your WiFi network, so no need for cables or even to have your PC in the same room. 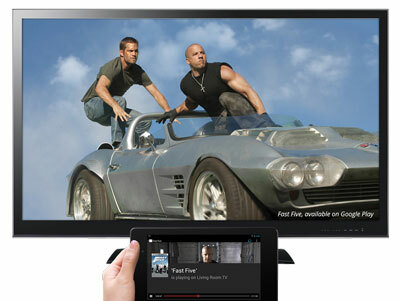 Plus, Chromecast also works with all of your Android and iOS devices, too. can you stream music as well? Any music you can open through the Chrome browser can by streamed to Chromecast. Those could be MP3 files on your computer or a streaming service like Pandora or Songza. Chrome does not handle Flac (lossless file), at least not natively (if you don’t know what those are, you don’t need to worry about it). Music streaming from Android or iOS device is limited for now. You can stream music from Google Play or YouTube, and soon Pandora, but that’s it. The Chromecast has completely sold out on Amazon and Google, so sellers on Amazon are now gouging with their prices. Don’t go for it. More will be available soon and the prices will come back down to $35. You can also back-order directly through Google for $35 and they say it should ship in 2-3 weeks. I received & installed my new Chromecast this weekend. It was easy to set up, but the first thing I tried to stream - a video from Vimeo - was delayed by half a second from what I was seeing on my laptop, so the sound was out of sync. Very disappointed. Were you trying to watch on the TV but listen to the sound from your laptop? Any time you stream to another device there’s going to be some delay (one device has to send the signal out, the other has to to take it in and process it), so you should watch and listen to the sound on the same device, which should be in sync. We took our Chromecast on the road and tried to use it in a hotel TV that had free HDMI ports. Both the Hilton tech support line and Chromecast’s own support confirmed that it would not work because the hotel’s wi-fi was not password protected. Yes, you have to open a browser and enter your name and room number, but without password protection, it simply won’t let the Chromecast and your laptop talk to/recognize each other. So no go for travel, sadly.